Here in the increasingly odd limbo between thesis submission and viva I am reaching out in all directions, re-knotting my nets against the coming uncertainty, remembering who I really love to talk with, work with, share with, and making sure we stay in touch. Also, I’ll be honest, I’m doing this with one eye on what will look good on the CV and making just enough money to eat whilst I write The Book. Or possibly two. Those of you who know me will have some idea of how diverse that network of people around me is. In any given day I might be connecting with colleagues in the Yoga Nidra Network, allowing exercise specialists to audit my work with children with disabilities, talking with other early-career scholars about updating ethical protocols for research processes, getting academic publishing staff to teach me how to manage the editing process for peer review, learning how to record interviews for podcasts, and preparing for the upcoming Accessible Yoga Conference in Germany. So although I now need a spreadsheet, a task app, and a mind map to remember it all, it also delivers plenty of moments of serendipity, of unexpected connectivity between these very different roles and tasks. To give just one example, a very well respected scholar-friend of mine spent two hours today generously telling me what kinds of questions he would ask me if he was in my viva exam. It was a wide and sometimes rambling conversation, and at one point I managed to use a scene from the Spanish poet and playwright Lorca’s El Publico as a way of explaining performing identity via Instagram, and it’s not often you get to bring those two worlds together. There’s about 6 people that will get that reference and go ‘oooh!’, but it’s not that clever an insight to go looking for it. Do go looking for Lorca’s El Publico for other reasons though, because it blew my mind as a young woman, and someone once told me that anyone who learns Spanish will go through a phase of loving Lorca’s work, so crack on if you haven’t. It’s relevant to talk about here only because I haven’t read that play in 20 or more years, but because I was speaking to someone in Spain, it popped up as a useful reference in my often untidy mind. I’m often fascinated at the useful metaphors we pick up and hold on to in order to explain that which we otherwise find difficult to translate to others. If an image really shines, in theory it doesn’t matter where it comes from, in terms of illuminating some cultural phenomenon. In practice, of course, you’re more likely to get people to take you seriously if your reference points are from classical literature than if you take them from pop culture. I don’t know if the Oedipal Complex would have been such a resonant idea if it had been based on the plot of a sordid pulp novel, for example. But because genre fiction often involves stories told through archetypal images, popular culture can be a rich seam for metaphors for understanding new aspects of the human condition. In informally chatting, I’ve noticed that a surprising number of Religious Studies scholars, including myself and one of my supervisors, will commonly use examples from Terry Pratchett’s books to illustrate some fundamental idea about the human and more than human universe. We’ll rarely write a whole thesis around them. But all sorts of cultural stories stick with us because they seem to resonate beyond the story – they are archetypal, or typical in some way of how (some) human beings see the world. Magic as it exists in good works of fantasy ‘feels right’ only if it works in a way that somehow makes sense in our world too. 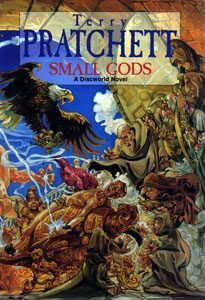 The gods, according to Terry Pratchett, a lifelong atheist, exist because of our belief in them, and he provides plenty of detail to flesh out that idea, and accompanying archetypes and metaphors for us to play with. My friend and colleague Vivian Asimos researches online communities, and the production and transmission of contemporary forms of myth, particularly creepypasta. (Insert content warning for scariness if you don’t know what creepypasta is and go searching for it). Apparently one creepypasta site had a banner legend that read ‘everything here is true, even when it isn’t’. This is an idea that’s really resonating for me recently – that a lot of what we ‘believe’ isn’t so much absolute faith in the existence of a thing, so much as it is a suspension of our disbelief. To what extent do we act as if murtis are divine, chakras spin and mantras have power, because when we do, those things are true, and we can interact with them? To clarify, I’m not talking about a kind of personal echo chamber in which you are the only creator of your reality, and you can wish your way out of illness, poverty, or oppression. I’m not talking about picking and choosing beliefs from (often oppressed) cultures at random. I’m talking about those epic and mythical stories, like the Ramayana, in any culture that have such weight they sink through the heights of our creativity and imagination and soak into and change the world beneath. I’m talking about something beyond ‘real’ and ‘imagined’, or ‘fact’ and ‘belief’. I’m talking about those aspects of culture that have the power to transcend those divisions. 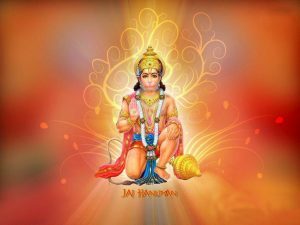 I’m suggesting that Hanuman really is somewhere wandering the Himalayas, and that he really does need us to keep singing his name, to remind him of his existence. It might not be a way of being in the world that applies to all of us, but I’ve always maintained that life is more interesting when you believe there are fairies at the bottom of the garden. As the great Religious Studies scholar Bruno Latour tells us, we have never really been as modern, or as rational as we think we are. It’s an idea that has legs, and I’ll run with it a while, as a way of thinking about belief, and practice, and meaning, as a way to honour traditional knowledges alongside newer cultural creativity, and as a corrective to the relentless ‘rationalism’ and austerity that is, after all, little more than another kind of collective illusion. Terry would have approved, I think.